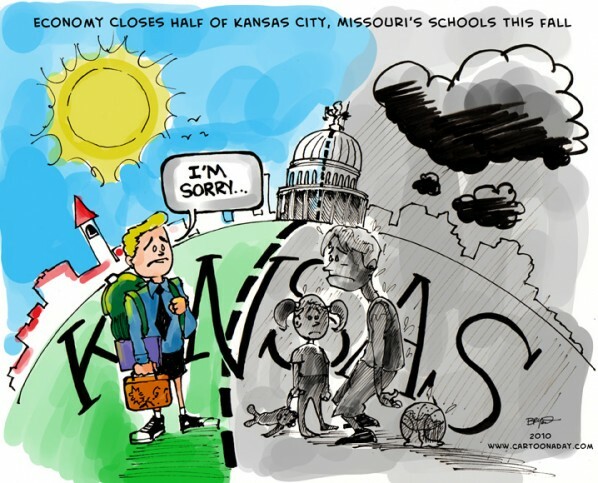 Sad but true, Kansas City’s schools are in for a big cut. No one seems to know exactly how they plan to pull this off, but the School District is planning on shutting down 29 out of 61 schools. THis plan will eliminate hundreds of jobs, teaching positions and shuffling thousands of kids around. Details are still forthcoming. Stay tuned to Cartoon A Day for more on this. Pictured as its own little world, Kansas City, Missouri is seen as divided in half with a dotted line. School kids on each side share feelings or guilt and despair. Inspiration: Inspired by Kansas City School Closings, unemployed teachers, the bad economy and suffering kids.